Arabsat-6A is the first commercial satellite slated to launch on SpaceX's Falcon Heavy rocket. The launch is scheduled for 6:35 p.m. Eastern April 11. Credit: Jordan Sirokie for SpaceNews. COLORADO SPRINGS — Arabsat chose SpaceX’s Falcon Heavy rocket to launch its newest satellite in order to give the satellite a longer lifespan, Khalid Balkheyour, Arabsat’s chief executive, said in an interview with SpaceNews. SpaceX’s launch of the Arabsat-6A communications satellite is scheduled for 6:35 p.m. Eastern from Space Launch Complex 39A in Cape Canaveral, Florida. Upper level winds in the atmosphere scrubbed yesterday’s launch attempt. The mission is SpaceX’s first with a commercial Falcon Heavy customer. Saudi Arabia-based Arabsat announced plans to launch with SpaceX in spring 2015, but at the time hadn’t decided between the Falcon 9 or Falcon Heavy. The company selected Falcon Heavy in September for a mission anticipated in late 2017 or 2018. Balkheyour said Arabsat chose the Falcon Heavy in order to extend the lifespan of the Arabsat-6A satellite beyond the 15 years a geostationary communications satellite is typically designed to last. “We needed more lifetime for the satellite, so we had the option: Falcon 9 or Falcon Heavy, and we decided to go with Falcon Heavy,” he said. Arabsat-6A is a large satellite, weighing 6,460-kilograms. Balkheyour said preliminary calculations show the satellite will get an extra boost from Falcon Heavy that should extend its life to between 18 and 20 years. 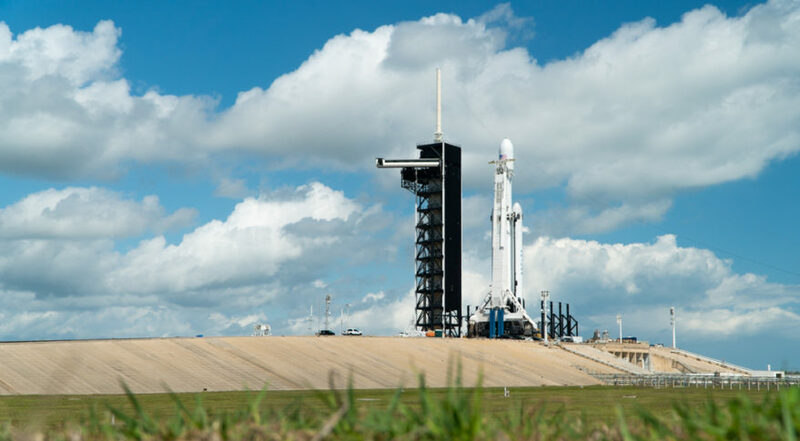 SpaceX experienced delays with the Falcon Heavy that pushed the Arabsat-6A launch to 2019, a setback Balkheyour said was upsetting, but tolerable. “I don’t mind that as long as we get it right and in orbit with good quality checks and good health,” he said. And the delays were not solely SpaceX. Arabsat-6A is just the second to use Lockheed Martin’s modernized LM2100 satellite platform, which features over two dozen upgrades, including new avionics, flexible solar arrays and a reprogrammable mission processor. Arabsat was Lockheed Martin’s first customer for the LM2100, and while Balkheyour said Arabsat is impressed with the platform, it felt the need to conduct additional testing prior to launch. “We were scheduled about a month ago, [but] we had to do more checks and quality assurance stuff with the satellite,” he said. The first LM2100, SaudiGeoSat-1/Hellas Sat-4, launched in February on a European Ariane 5 from Arianespace. Lockheed Martin has three other LM2100 satellites under construction: Japanese operator Sky Perfect JSAT’s Jcsat-17, and two SBIRS missile warning satellites for the U.S. Defense Department. Balkheyour declined to say what Arabsat paid for the Falcon Heavy mission (SpaceX advertises Falcon Heavy launches as $90 million). He also declined to say the price of Arabsat’s two-satellite Lockheed Martin order, which at the time of announcement was estimated at $650 million. Balkheyour said Arabsat wasn’t afraid of trying new technologies on launch or manufacturing for the satellites. Arabsat-6A will take 16 to 17 days of orbit raising using its chemical propulsion system to reach its perch in geostationary orbit 36,000 kilometers above the Earth, Balkheyour said. From there the satellite will provide television broadcasting and internet connectivity services to customers in the Middle East, Africa and Europe. Balkheyour estimated that 40 to 50 percent of the satellite’s capacity was presold prior to launch. Arabsat-6A carries Ku- and Ka-band transponders. The launch will be the first for Falcon Heavy following its February 2018 demonstration flight carrying a red Tesla roadster. SpaceX has other commercial customers, including Viasat, Inmarsat and the U.S. military, for future Falcon Heavy missions. The launch will also influence the certification process for the U.S. Air Force to launch national security payloads using the rocket. After the launch, barring a failure, Arabsat will have nine satellites in orbit — seven for its core fleet and two for its Greek subsidiary Hellas Sat. Balkheyour said Arabsat is designing another satellite now, and anticipates having a request for proposals ready for manufacturers by this fall.